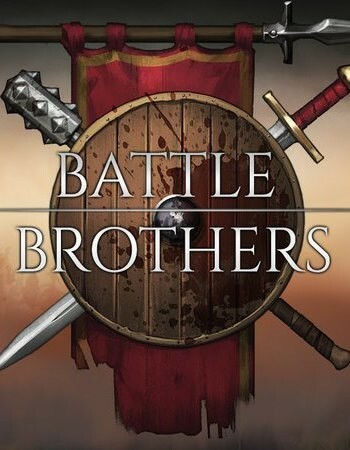 Battle Brothers turn-based strategy-RPG in which the player controls a squad of mercenaries wandering around in a small-magical medieval world. You decide where to go, who to hire, or with whom to fight, what contracts to take and how to arm, and educate your people in the procedurally-generated world. The game consists of a strategic map of the world and a tactical combat map. On the world map you can freely travel, conclude contracts that will fill your wallet with coins, find places worth a robbery, enemies and cities in which you can replenish stocks and hire new people. Here, the level and equipment of the Brothers of the squad are raised. After you meet a hostile squad, the game will go to the tactical map where direct combat operations will take place, in a step-by-step mode. Procedural-generated: world map, tactical battle cards, mercenaries. All hired characters have their own background and characteristics, often associated with the previous profession. Do you want a stammering rat-trapper, a greedy hunter of witches, or a drunkard of an impoverished nobleman? Permanent death. All characters who fell in battle, will remain dead - if they do not return, like the undead. Up to twelve Brothers can participate in battle in a variety of, tactical battle arenas with different terrain and a difference in heights. The development of the character without limiting the class systems. Each Brother gains experience in combat and can raise the level by acquiring any perks from the available ones. Outfit, it matters! Different weapons provide unique skills - cutting of shields with axes, stunning clubs, etc. A diverse list of enemies with unique equipment, skills and behavior of AI. Battle Brothers has been completed. For those of you who really like the game and want to support us in the future, we also offer the Supporter Edition Upgrade. This includes the soundtrack plus a digital art and lore book with a lot of background information about the game, its art and its creation, as well as our very first legendary item in the game, complete with a look of its own and a unique background story: Fangshire.